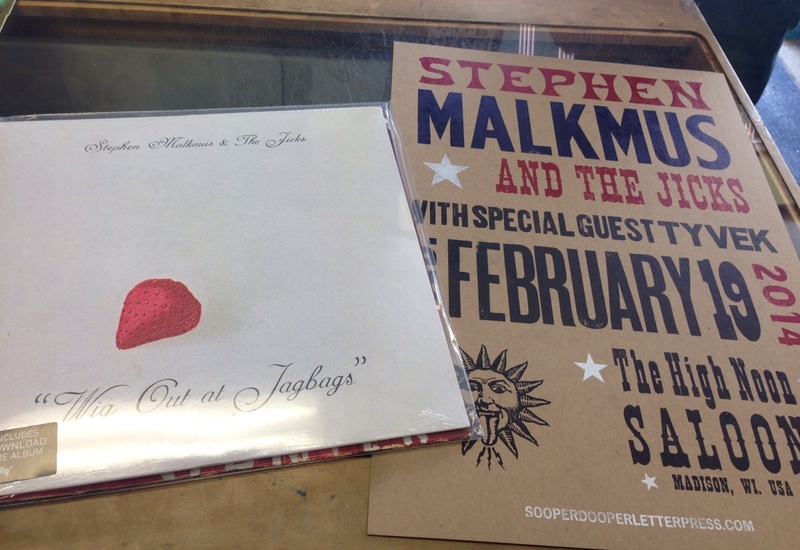 Stephen Malkmus & The Jicks Vinyl, Poster, and Ticket Giveaway! | True Endeavors Presents: music, tours, tickets, mp3 downloads, concert pictures, videos, Madison WI. Stephen Malkmus & The Jicks Vinyl, Poster, and Ticket Giveaway! Let’s start the week out right with an exciting giveaway from our friends at Mad City Music and Sooper Dooper Letter Press! Our big winner will not only land a pair of tickets to Stephen Malkmus‘ February 19 show with the Jicks at the High Noon Saloon, they’ll also get to pick up a free Wig Out At Jagbags LP and commemorative show poster! Enter to win this great bundle by leaving a comment with your favorite “wigged out,” unexpected, funny, or just plain puzzling Malkmus lyric below. Please have your responses posted by 6pm on Sunday, February 9. A winner will be chosen and notified shortly thereafter. Good luck! Miss the giveaway? Don’t worry, you can still find tickets here. Pretty much danced our arse’s off last time Malkmus and Jicks played the High Noon- me and the lovely. Going to truely miss Janet banging drums but no matter… love the new album and can’t wait to see some of it performed live in such a great local setting. Groove’n and gyrate;n at the High Noon. I love Malkmus! From his stream-of-consciousness lyrics to how he weaves his spontaneous jams into his live material. He’s just so damn jazzy! From “Senator” . You can’t get much better than a song with a chorus about blow Js…. free tickets? this would be awesome. right around my gf’s bday. help me be cheap!! Joseph S. Scharenbroch, the tickets and album are yours! Congratulations! Check your e-mail for more details.